As part of the Sewing Summit, we were given the opportunity to participate in a blind swap with other participants. 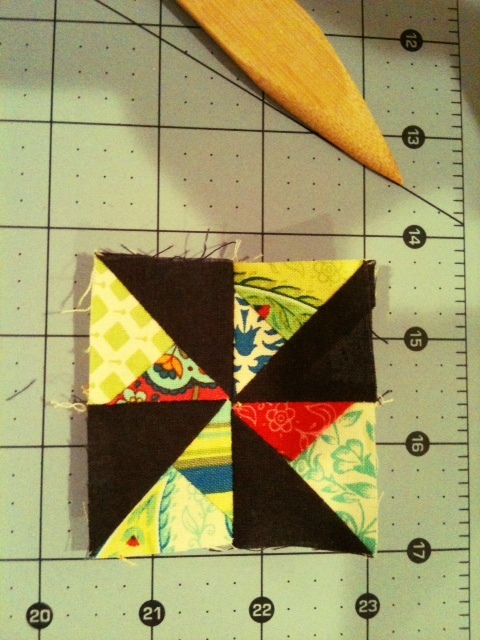 As part of the swap, we will create either a mini-quilt or a zippered pouch, whichever we chose. These reflect "hot topic" items at the Summit for participants. 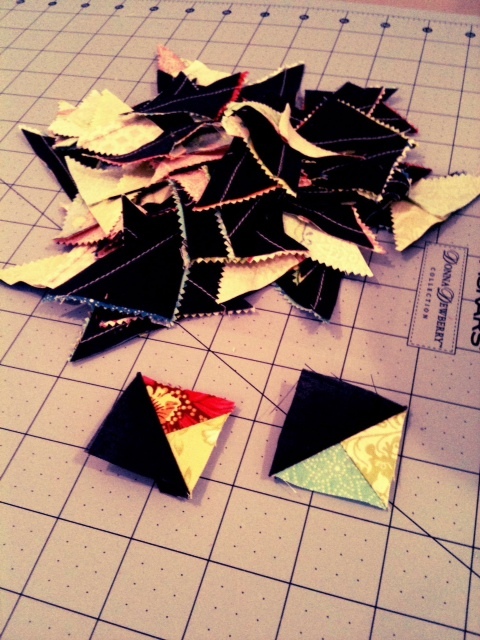 Using the pre-cuts in our swag bag from the Summit, I put squares together and created half square triangle squares. 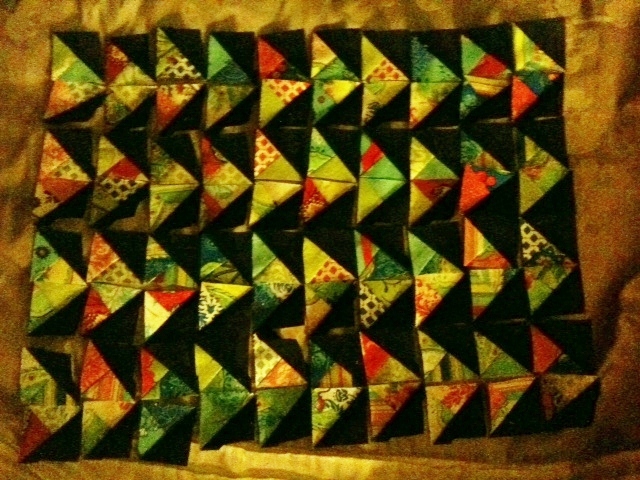 Then I sewed blue solid to those and created another square comprising of three triangles. I pondered making these into geese blocks or into pinwheel blocks and ultimately decided geese was appropriate. Last, it was a question of layout. All one direction or in different directions? Since the geese were pieced, different directions also seemed to be the better choice. All sewn up and it looked like my geese were confused. Now, I would like to pause a moment here and give you a little advice. USE AN IRON, even when working with little pieces. The temptation, when these pieces are so small, is to use a wood presser, fingers, roller, etc. However, I learned that it can lead to seams not laying flat enough and then you can't get matching lines. Look okay? 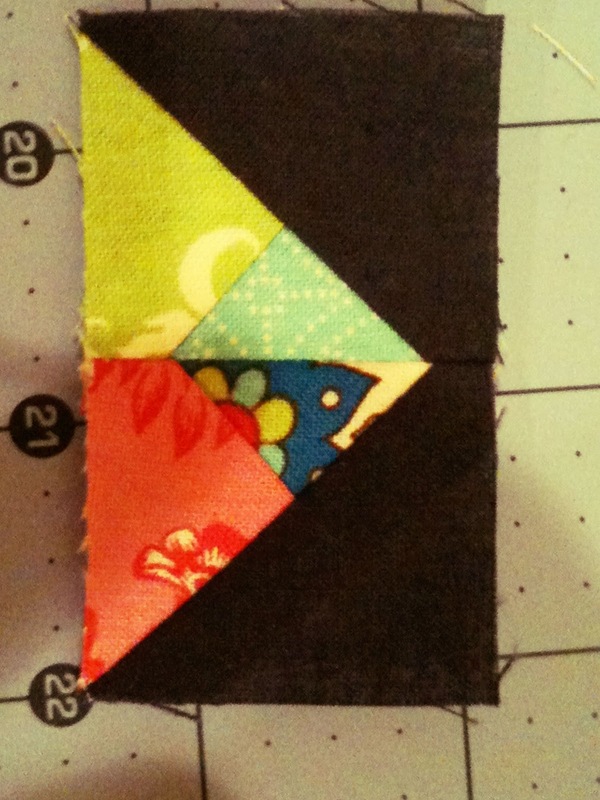 I used a simple straight line quilted edge and chevron pattern as the quilt motif. 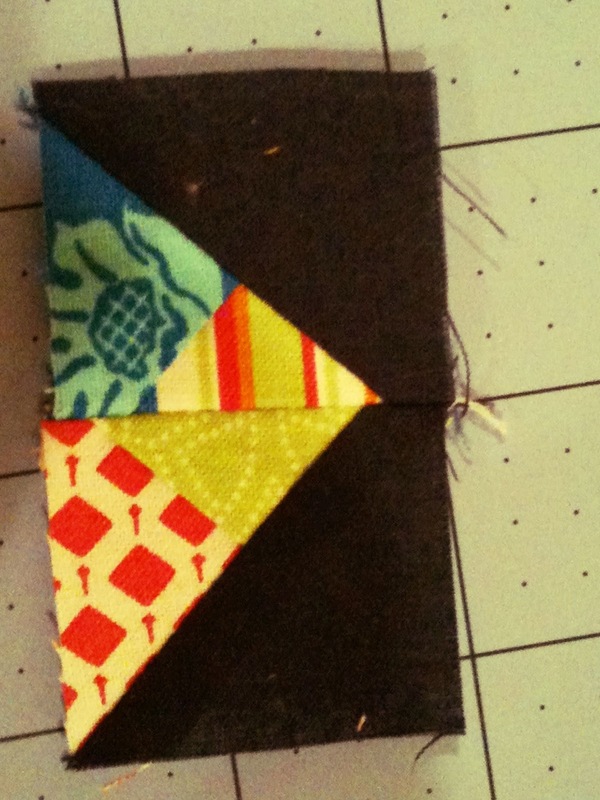 Contrasting thread felt right even though I knew it would show errors easily. Undettered, I quilted away. Poor partner. 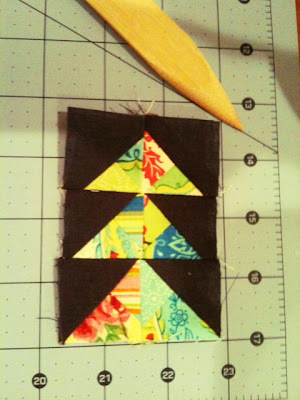 Also completed this week is a set of 4 reversible placemats for my sisters. I saw the M&M fabric and it screamed my sistser's name. Then I showed her the cookie monster fabric and she loved that, too. So, reversible placemats were decided upon. (Although she will have to wait until next year to use the M&M side). How is your crafting going? Thanks for the tip on the geese. Oh My Gosh! how did you have the patience? i have only done small geese using foundation by the yard. In fact i have only done LARGE geese using f.b.t.y! I love the name of that quilt . The geese may be confused but they look fantastic. All those geese would have driven me mad. Great job Becks. There is NOTHING wrong with earthy colors!!! Awesome items being made in your sewing room BecK! Love your confused geese! !